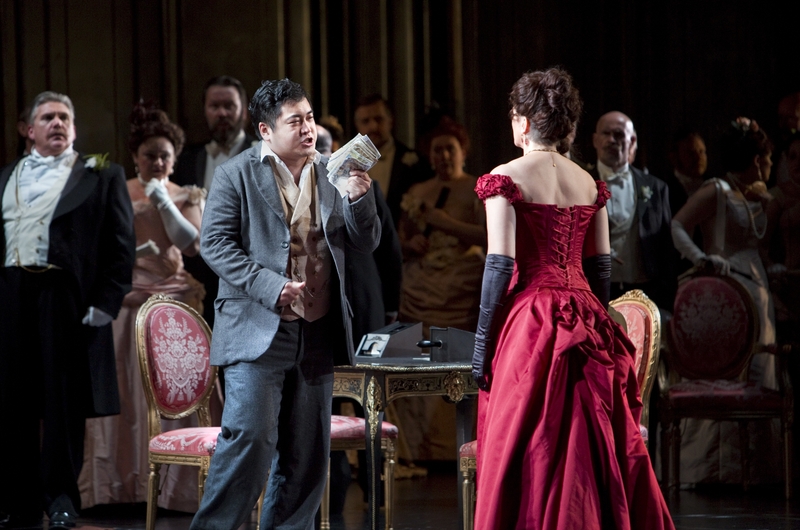 Verdi’s La traviata is the most popular and most performed opera in the world. It’s also an opera which I hadn’t seen before last night. Although, I’ve only seen 2 before: 1 I hated, 1 I loved. I was hoping I would fall in love with this one, particularly given that it includes a “Drinking Song”. 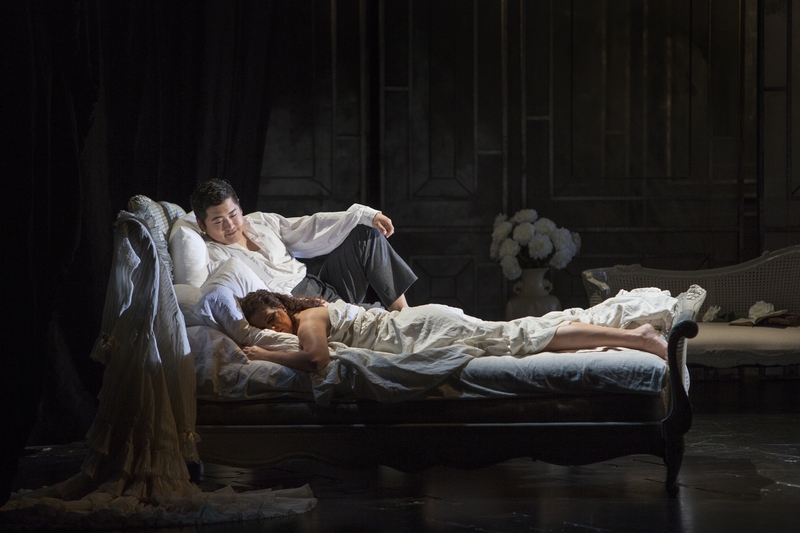 I recommend listening to the famous duet (you’ll recognise it) whist reading my review of WNO’s La Traviata on tour at Birmingham Hippodrome. The opera’s title – La traviata – means literally The Woman Who Strayed, or The Fallen Woman. It is based on ‘La Dame aux Camélias’ (1852), a play adapted from Alexandre Dumas’ novel of the same name. He had written a fictionalised account of his own affair with a courtesan (a posh way of saying prostitute), Marie Duplessis. He does nothing for the stereotype of French men. Based in Paris, La Traviata tells the tragic love story of courtesan Violetta and her affair with Alfredo. Alfredo has fallen head over heels in love with Violetta, but his meddling father Germont disapproves of the ‘fallen woman’. He persuades Violetta to leave Alfredo, as she would bring shame on the family. It is only when Germont hears that she is on her deathbed that he realises the error of his ways, and confesses all to Alfredo. Alfredo comes to her bedside to reconcile their true love. But it’s too late. Sir David McVicar’s production is a traditional staging in the sumptuous salons of 19th century France. It’s a striking set, with black and white drapery lit by candles. Upper class parties play out, before intimate moments in the romantic couple’s boudoir. The costumes come straight out of The Moulin Rouge and Toulouse Lautrec’s colourful, Parisian posters. Linda Richardson sings the role of Violetta Valéry with confident grace. This party girl floats the high notes with delight and evokes passion, particularly during the scene on her death bed. Australian-Chinese tenor Kang Wang also makes his debut with the company in the role of young bourgeois Alfredo Germont. He’s an impressive and assured Italianate tenor, who brings real emotion to the tale. James Southall conducts a superb orchestra, accompanied by an excellent chorus. Verdi specialist Roland Wood plays an excellent Giorgio Germont, while the Parisian salon is hosted by Rebecca Afonwy-Jones, who brings sass to the stage. I can see why La traviata is a favourite with opera audiences across the world. I find myself wrapped up in this story of conflict, with duty facing love, and the evocative, moving music. As it comes to its dramatic climax, I know I’ve fallen in love with Verdi. Big, bold and overwhelmingly romantic: this is what opera should be about. On aggregate, La traviata brings it to 2 – 1 in favour of the opera.